If you experienced a workshop that resulted in you giving the best speech of your life, what would that class be worth to you? What if you took a workshop that gave you the processes to create more of those best speeches? This program is not just about creating one great speech. And it’s not just about getting the formulas to create more of them. It’s also about becoming a great speaker. 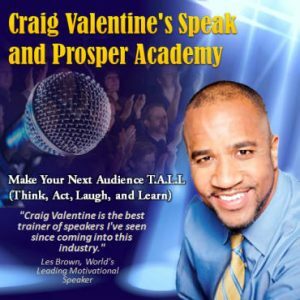 In the 2 hours and 39 minutes on these 3 audio CDs (including 1 live keynote speech and 2 live workshops from Craig Valentine), you’ll get the most meat per minute of speaking lessons you won’t find anywhere else. Need proof? Where else will you pick up 97 ideas and tools you can use to rapidly lift all of your future speeches to top-notch levels of impact and connection? Warning: These 97 tools come flying at you fast, but, if you’re able to grab hold of them, you’ll build yourself into the kind of speaker others sign up and line up to see. 19. How to get your audience to buy into your message even before you drive it home! Craig Valentine delivered these 3 presentations to the same conference over a 3-day period in Miami, Florida.